Located in Marriott Shoals Hotel and Spa in Florence Alabama, Swampers Bar & Grille is the perfect place for dining, drinks, and entertainment. In fact, out of all of the places that we visited in Florence, Swampers was definitely our favorite hang out spot. Swampers Bar & Grille is located in the Marriott Shoals Hotel and Spa, which is where we stayed, so it was really convenient for us to go down to the lobby to grab a drink or snack. Our first day in Alabama, we had a few draft beers from local breweries while we waited to check in. The next day, we loved it so much that we decided to watch most of the Alabama vs. Auburn game there. We drank wine and local beer, ate really good snacks (pictured below), and cheered on our teams. It was so fun being in Alabama for that game! Then, after attending our good friends wedding (which is why we were in Florence to begin with), we stopped by the bar for a nightcap – I got a glass of wine and Ian got one more local beer. For starters, I love the fact that it is centered around music. This is by far my favorite part about the bar and grille. 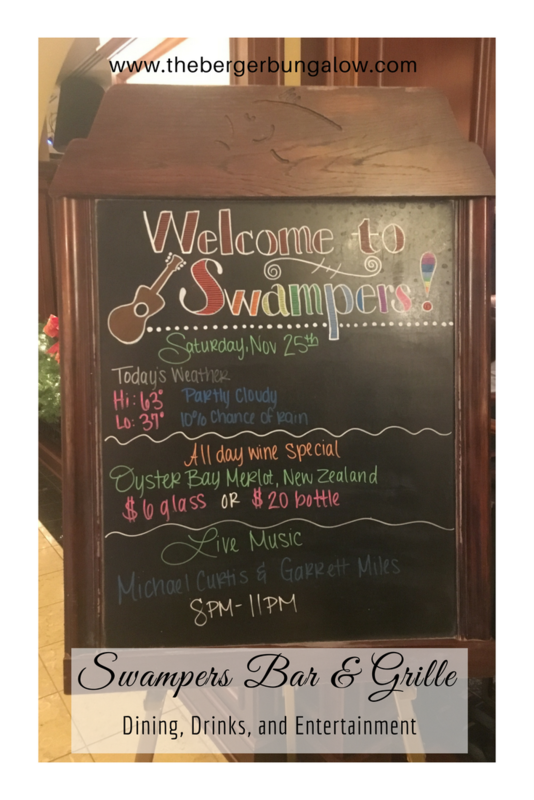 Swampers Bar & Grille has live entertainment 7 days a week, 365 days a year, showcasing local artists. As soon as you walk in the door, you cannot help but notice all of the pictures of famed musicians who were a part of the muscle shoals music scene – it was basically a tribute to Muscle Shoals music. To be honest, before visiting Florence, I had no idea that it was such a cool city that revolved around music. Swampers introduced me to that extremely awesome history that I should have already known. Come to find out, my cousin even partially recorded one of his albums at Muscle Shoals Sound Studios. So cool to learn some history about my family during our visit, as well. I’ll chat more about this in my Florence Travel Guide when I post it! The outdoor patio space in Swampers is a fantastic place to hang out, spend time with family, grab a meal, and/or watch football! My favorite part of the outdoor space are the fire pits – it made it really relaxing and cozy. Everyone was so nice! The bartenders and waiters were all so helpful, fun, and accommodating. The food was great and the ingredients tasted fresh and high-quality. We did not have a bad bite! A crispy tortilla filled with braised short rib, kimchi-inspired slaw, and poblano aioli, with a lime on the side. This dish was out of this world good! I love a good cubano and this was right up my alley. Pressed cuban bread stuffed with braised pork, smoked ham, pickles, Singin’ River beer mustard, and swiss cheese, this sandwich was hard to put down because it was so good. By the time we got around to the quesadilla, we were so full, but once we tried it, we knew that it was all being eaten. So good! On top of lunch, dinner, and drinks, Swampers also offers an amazing breakfast spread. We unfortunately did not get to try it on this trip, but I cannot wait to go back to try it and also explore the city more – there were so many things that we did not get to do or see! I highly recommend trying out Swampers Bar & Grille, located inside Marriott Shoals Hotel & Spa when traveling to Florence, Alabama. I cannot wait to tell you more about this cool city and our experiences there!